What does that set of knobs on bottom part of the left side of the dash do? Would you happen to have any pics.? Thanks!, The 'o' is overdrive right? 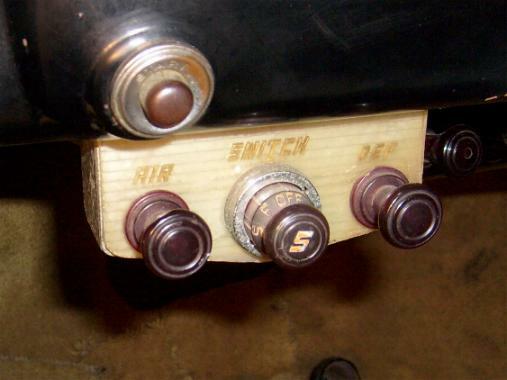 And do you push that in?And What is that little knob above the hood release? Push the Overdrive cable IN to engage overdrive and pull it out to take it OUT of overdrive. 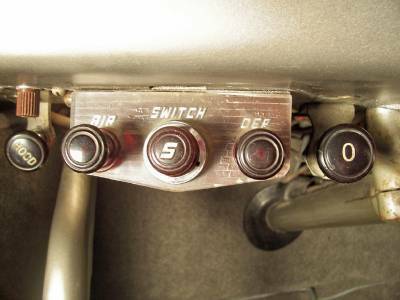 That little switch that you see above the hood cable is the instrument illumination dimmer switch to increase or decrease the brightness of the instrument lites. I have an original owner's manual for a '48 and it has no pictures or description of the heating/defrost system. It doesn't have a description of the radio and it's operation either. It's a real skimpy owner's manual. The '46 and '47's are the same. The '48 manual shows the interior front compartment for a '46 to boot! The pre-war manuals were much more complete and accurate. Well, does anyone know where I could find an owner's manual? I am also looking for a hood release and a window pump for a good deal, I just need ones that work nothing fancy. Owner's manual reprints show up all the time on E-Bay and go for around $20.